Please send your child to school in clothes that allow free movement, encourage active play and ones that the child does not have to be concerned about getting dirty. REMEMBER, children work with paint, glue, markers, clay and play in dirt and sand. Some of these will, no doubt, get on their clothes. Children who are newly toilet trained or hesitant to use the bathroom should wear clothes that they can easily remove as the children are encouraged to help themselves in every way possible. No overalls please unless they can manage them alone. Outdoor play is an important part of our day at Noah’s Ark. The children play outdoors everyday. Children are not allowed on the BIG Toy climbing equipment without the proper tennis shoes. Sandals, flip flops, thongs, fancy dress shoes and jellies can cause serious injury. Please have your child wear the proper footwear daily for safe outdoor fun.. Please send the children adequately dressed for the weather at all times as we do not keep extra coats at school. 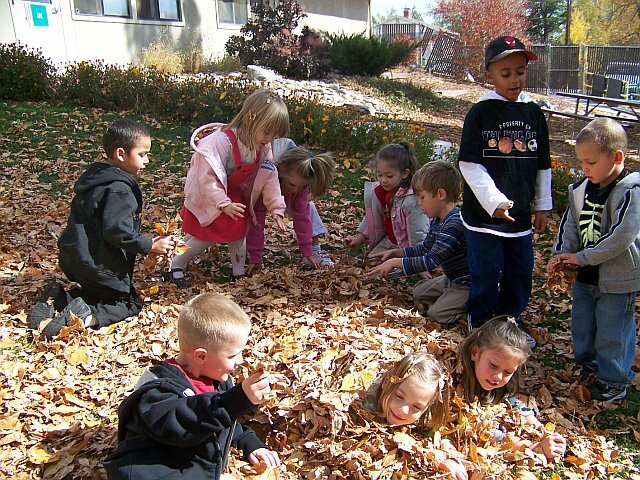 Children need the fresh air in all kinds of weather, even if it is only for five minutes. If you are unsure about the necessity of snow boots, send them in a sack with the child’s name marked on both boots and on the outside of the sack. Please help us prevent loss by clearly labeling all of your child’s personal items. All items of clothing are collected from cubbies and shelves every Friday and placed in the “lost and found” bucket. These items are set out frequently so parents can check for lost items. Unclaimed items are donated to a charity organization. We do keep a limited supply of extra clothing on hand for those occasional accidents. We ask that you return them as soon as possible.